Has a life of fine dining at sea lost its Allure for chef Molly Brandt? 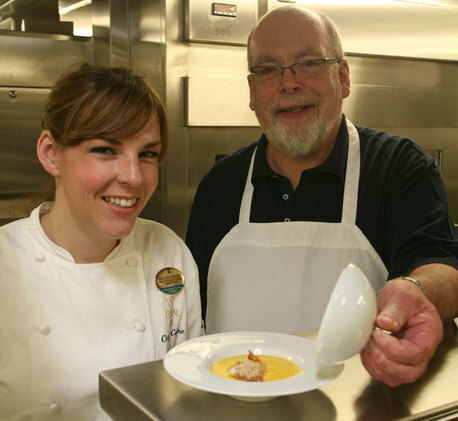 Home/Cruise Food & Drink/Has a life of fine dining at sea lost its Allure for chef Molly Brandt? The minute chef Molly Brandt saw me take a knife to an onion, she rolled her eyes in despair. She wanted the vegetable finely diced in preparation for making her smoked sweet potato velouté and realised immediately she was dealing with a rank amateur. I thought I knew what I was doing. I’ve made soup before – it all goes in the liquidiser in the end anyway, so why the need for precision? Chef Molly soon put me straight. If my take on her signature soup was to make it onto the tables of the $40-a-head 150 Central Park restaurant at the heart of Allure of the Seas I was going to have to pay attention and follow her instructions. “This is too big,” she declared, screwing up her nose as she held up a half-inch slice of onion and then demonstrating how I should have cut across it before chopping down. Fortunately for her and the diners, one of her sous chefs had already prepared the sweet potato into neat dice; no way was I going to be allowed to mess that task up. After that shaky start the rest of the lesson went well. With the vegetables cooked, and a precise amount of smoked paprika added, it was time to add stock and blitz the mix in the aforementioned liquidiser (at which point I must resist the temptation to say “I told you so”). Then came the touches that turned a humble bowl of soup into a fine dining experience worthy of Natalie Coleman’s victory last night on TV’s Masterchef. A teaspoon of sherry cream was stirred in and wafer-thin slice of crispy-baked Serrano was placed delicately on top before the surface was dusted with a shake of almond powder. The crowning glory came with a blast of hickory smoke from what was – literally – a smoking gun. On went a cloche and the velouté was ready to serve. It was a thoroughly memorable experience during my brief pre-inaugural visit to the biggest cruise ship in the world in November 2009. I was delighted to renew acquaintance with chef Molly when I cruised on Allure two years later in January last year and spent a thoroughly enjoyable evening treating myself to another of her sensational menus – this one included a parsnip velouté with a buckwheat waffle, whipped buttermilk, maple gel and American paddlefish caviar. So I was disappointed this week to discover that Molly is leaving Allure of the Seas and that her restaurant’s menus will now be overseen by Michael Schwartz, who runs the identical establishment on sister ship Oasis of the Seas. Michael’s cooking is good, no doubt about that. But he’s not Molly, who graduated from the prestigious Culinary Institute of America and has appeared on US television’s Iron Chef as well as working in restaurants in Beijing, Shanghai and Tuscany. While at 150 Central Park she also created and updated menus for Azamara Club Cruises, the boutique two-ship line also operated by Royal Caribbean. I’ve got my fingers crossed that she has not left the sea for ever and that she will soon reappear on a cruise ship. It’s time I had another lesson. Is that a gun in Molly’s hand, or is she just pleased to see you?